Let me start by mentioning that Paloma Faith is one of the nicest human beings I had the pleasure of working with, whilst at Bestival, back in the day when I was the (Global) Social Media Exec at AllSaints. Paloma was friendly, welcoming, full of humour, laughter and was genuinely just a total joy to be around. Since then, I have indeed followed Paloma’s musical career and admired her for speaking out about her parenting methods. So when I saw that Paloma had joined forces with Cosatto for a creative collaboration, I was ready to be hooked. I knew that Paloma would create something unique, fun and eye-catching; but the collection itself is just stunning. Using my favourite print of all, Leopard, Paloma and Cosatto have created a range of items from newborn that have bags of style, personality and of course, functionality. For the low-down on the collaboration, including some behind the scenes photos, scroll on below. Cosatto believes in celebrating parenthood by creating baby products that make a statement and stand out from the crowd. The new collaborative range, therefore, is irreverent, opulent and confident, bringing a new dimension to the parenting experience. Hear Us Roar reflects the huge leap in popularity of animal print across all design categories. The leopard print design features on Cosatto’s bestselling model, Giggle 3, the classic pram and pushchair. Channelling Faith’s signature retro Hollywood glamour, the design is also available on an oversized hat box changing bag. This is alongside a coordinating leopard print footmuff. Taking its luxury travel system, Wow, Cosatto has also crafted a short run of prams taking reference from the ancient orient and 19th century Russian decorative arts. This limited-edition design features state of the art printing techniques, traditional style embroidery as well as enamelled gold trims. Other highlights include a leatherette handle in teal, air filled tyres together with an extra-large carry cot. The travel system also has a coordinating luxury footmuff. Finally, there is the Paloma Faith for Cosatto original coordinating Utility Bum Bag. This statement accessory can hold an iPad, nappies and bottles. Commenting on the range, Faith says: “When I was a new mother, I felt like none of the designs out there really suited my personality. They all made me feel like I had to become someone else to be a good mother. 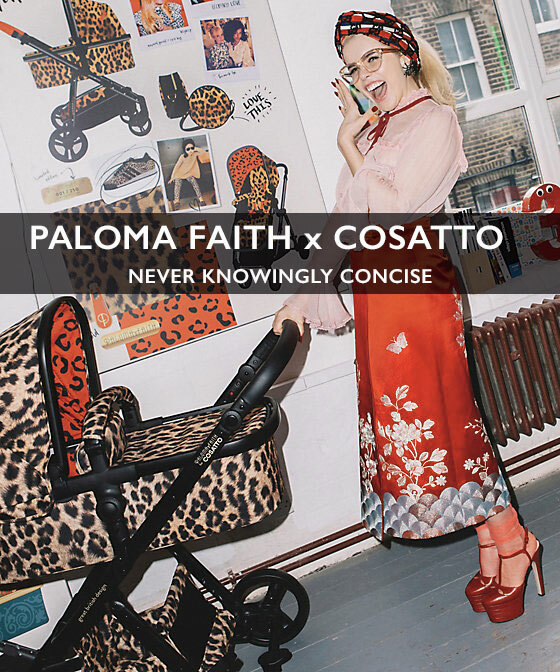 Vicky Morley, creative director at Cosatto, adds: “We are chuffed to bits to be working with Paloma. She is a creative force with a natural flair for spotting trends. Paloma has an uncanny sense for what is at once extraordinary, outspoken and outlandish, while at the same time irresistibly appealing. Meet the Cosatto Giggle 3 pram and pushchair. Taking gold-winning Giggle 2’s famous features and smooth handling even further, Giggle 3 is your nippy three wheel from-birth pram, reversible pushchair and Cosatto car seat carrier. Discover even more premium detailing, from the stitched leather handle to the deluxe amped-up wheels. Choose your statement around-town wonder. Relax with all you need from birth and beyond. Classic 3 in 1. No need to buy separate carrycot, pram or duo-directional pushchair – Cosatto Giggle 3 pram and pushchair’s got the lot from day dot. The from-birth carrycot, (suitable for occasional overnight sleeping), converts to pram mode. Swap it to the reversible pushchair seat unit when they’re ready to sit up – facing you first, then the world. Ultra-Portable. Compact Giggle 3 is your go-anywhere, stow-anywhere hero with flat-folding lightweight chassis. Great for smaller cars. User-Friendly. With height-adjustable premium leather handle for walking tall, easy-release buttons for mode-changes they can sleep through, pop-off swivel wheels to whizz under the tap and snoozy multi-recline seat – Giggle 3 makes life a breeze. Comfy All-Round. The luxury carrycot has maximised space to accommodate growing babies and the luxury zip-in liner is tailored for extra comfort. Add the matching Cosatto 0+ car seat to make Giggle 3 a travel system. Patterns Babies Love. Designed in their studio in the North of England, Giggle 3 unites Cosatto’s passion for design and baby science. It’s crafted with engaging, baby-pleasing patterns in the hood. Put your baby at the heart of the story and the heart of Great British design. Cosatto. Clever stuff for happy babies.